In this Photoshop tutorial, we'll look at how easy it is to create a seamless, cinematic-style panorama from multiple images using Adobe Bridge and Photoshop CS4. Photoshop has been somewhat capable of creating panoramas for quite a while now, but it wasn't until Photoshop CS3 came along with its dramatically improved Photomerge command that its ability to stitch photos together really began to shine. Photoshop CS4 takes things even further with some additional new features, including the ability to remove vignetting from photos, a common problem with wide angle images that used to result in panoramas having different brightness values as you moved across them from left to right. To get the most out of Photoshop's Photomerge command, it's highly recommended that you use a tripod when taking your photos, although it's not entirely necessary as long as you remain standing in the same spot as you snap the images and don't wander around. You'll want to lock in your exposure, focus and focal length so they remain constant in each photo. It's also very important that you overlap each image by at least 25% so that Photoshop has enough detail to compare between images when trying to stitch them together. If you're shooting with a wide angle or fish eye lens where a lot of geometric distortion occurs in the images, you'll want to double or even triple that amount since Photoshop will need much more information to work with. Finally, keep in mind that the more photos you're stitching together, the more memory Photoshop will require since it needs to open all the images at once. If your digital camera shoots massive-size files, it may be a good idea to save smaller versions of the photos first and work with those, otherwise Photoshop may slow to a crawl or may even run out of memory before the panorama is completed. Lastly, while it is possible to do everything we're about to do directly in Photoshop, it's easier and more convenient to first select the images you want to use inside Adobe Bridge and then select the Photomerge command also from inside Bridge, so that's what we'll be doing in this tutorial. Select all the images you want to use for your panorama inside Adobe Bridge. In Adobe Bridge, go to Tools > Photoshop > Photomerge. Photoshop will open automatically at this point if it wasn't open already and the Photomerge dialog box will pop open on your screen. If you look in the top center of the dialog box, where it says Source Files, you'll see a list of all the images we selected in Adobe Bridge, which means they're already loaded into the Photomerge command for us and ready to go. If we had selected Photomerge from inside Photoshop, which we could have done by going up to the File menu, choosing Automate and then choosing Photomerge, we would have had to click on the Browse button and then navigate to the images to select them, so we saved ourselves a bit of time with Bridge. 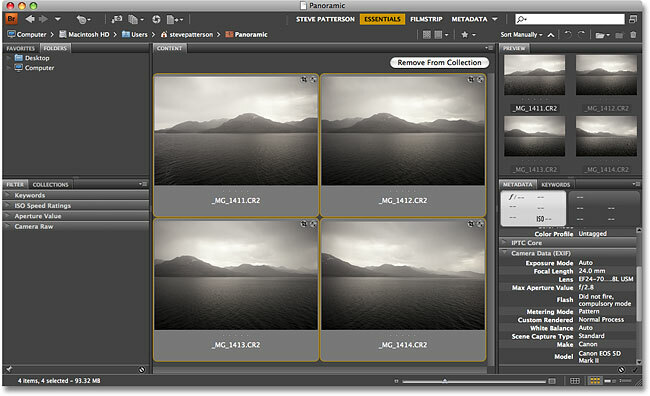 The images are already loaded into the Photomerge dialog box for us after first selecting them in Bridge. The "Auto" Layout option is selected by default and is usually the only one you'll need to use. You'll always want the "Blend Images Together" option selected. The other two will depend on your images. Once you have all your options selected, click the OK button in the top right corner to exit out of the Photomerge dialog box and run the command. Photomerge in Photoshop CS3 and CS4 is really nothing more than a combination of two other commands, Auto-Align and Auto-Blend, both of which were introduced in Photoshop CS3, and as you wait patiently for Photoshop to do its thing, you'll first see your images appearing on separate layers in the Layers palette, followed by small dialog boxes appearing telling you that Photoshop is first aligning the images and then blending them together. The images now appear on separate layers in the Layers palette, along with a layer mask for each image. The Photomerge command in Photoshop CS4 does an amazing job of stitching images together without any additional help from us. Drag a crop selection around the area you want to keep. Everything outside of the selection will be cropped away. And there we have it! That's how to create cinematic panoramas with Photomerge in Photoshop! Visit our Photo Effects section for more Photoshop effects tutorials!